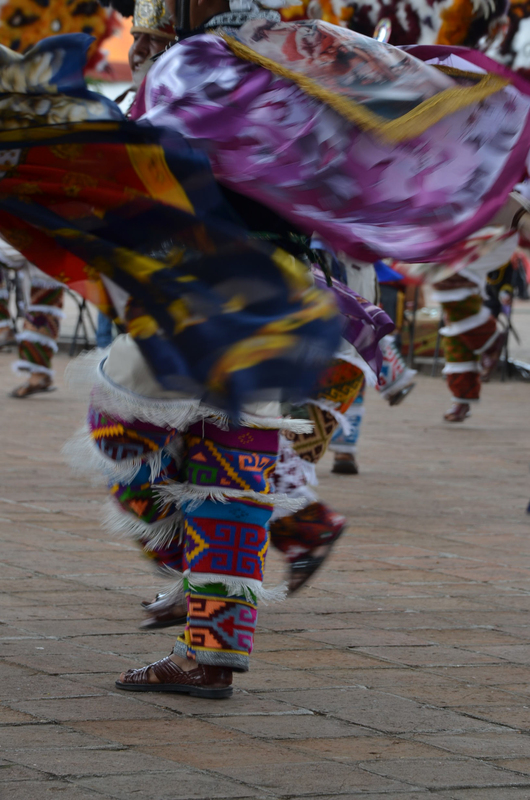 Many people come to Teotitlan del Valle, Oaxaca to photograph the extraordinary Dance of the Feather. This was how we spent Day 5 of our Market Towns and Artisan Villages Photo Workshop. Los Danzantes — the dancers — make a three-year commitment to recreate the history of the Spanish conquest of Moctezuma and the Aztecs through dance. The main characters include Moctezuma, Cortes, La Malinche/Doña Marina, the masked spies who gathered intelligence for Cortes, and an assortment of soldiers and warriors. 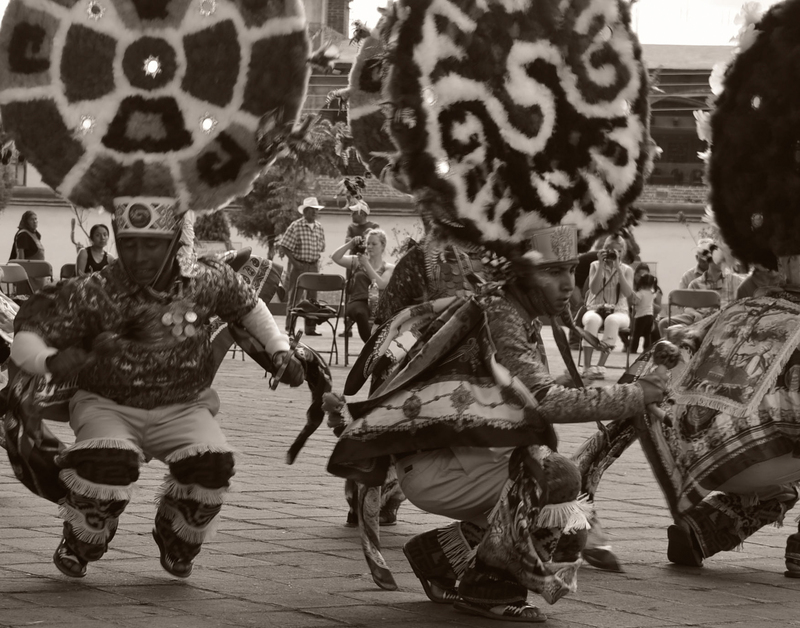 However, this is an ancient Zapotec ritual dance that pre-dates the arrival of Cortes and the conquistadores to Oaxaca in 1521. 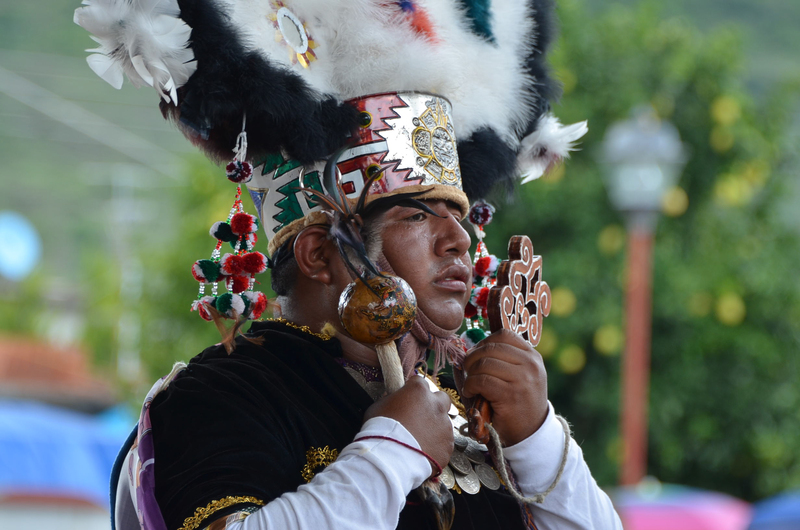 The ritual dance was integrated into a festival to honor the patron saint of Teotitlan del Valle and her church, Preciosa Sangre de Cristo. It begins every year on the first Monday of July with the Parade of the Canastas to coincide with the full-moon. The subtext includes tribute of mezcal, beer, bread, and maize. Pre-conquest dancers paid tribute to the gods of rain, corn, and fertility. This is not a folkloric dance or guelaguetza. 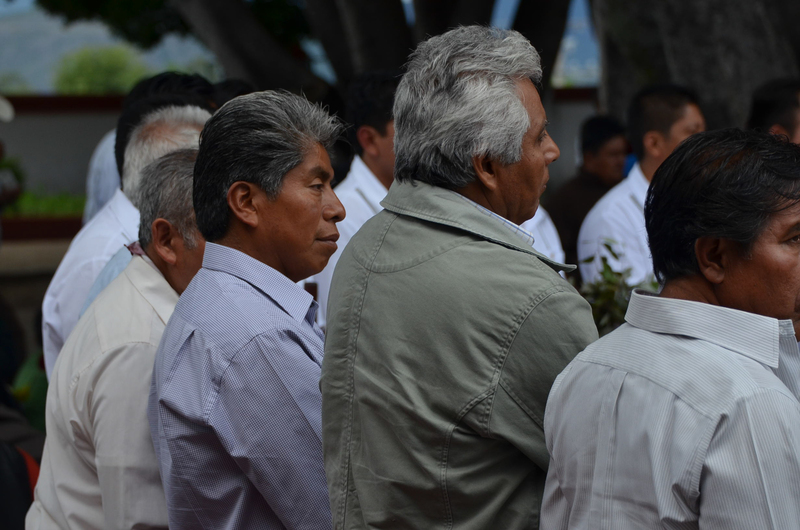 It is a serious part of maintaining culture, community, ritual and tradition in Teotitlan del Valle. The dancers take their commitment seriously and the community supports them in this endeavor. Everyone turns out to see the dancers. Even though the rains came during the afternoon, they lasted only about 30 minutes. Loyal viewers were undaunted and stayed; the dancers danced on. They endure a strenuous 10 hours of dancing on this first day that can be through intense downpours and brutal summer sun. Fortunately this year, the rain was short and the sky was overcast with just a hint of sunshine — much cooler than those sweltering in the U.S. midwest and east, and what dancers have experienced in years past. This is the last Dance of the Feather for this group that formed three years ago. 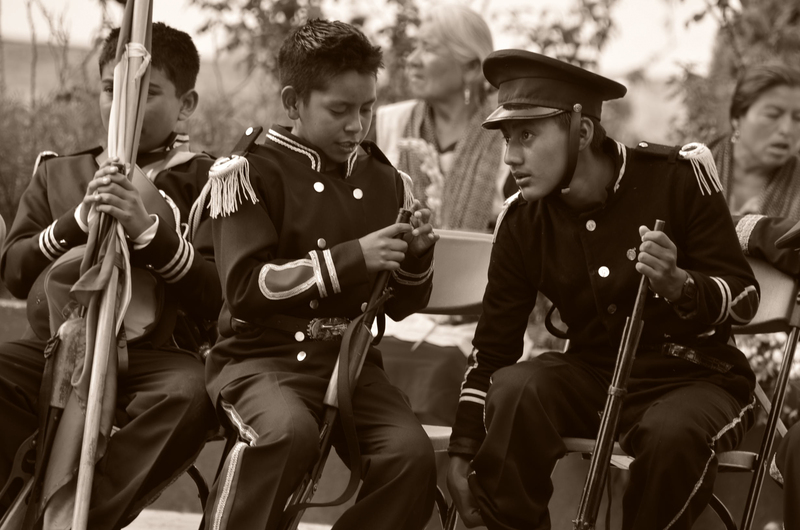 Tradition directs a village man who wants to be Moctezuma to organize a group. This group is larger than usual. They added a troupe of young boys to play the role of Spanish soldiers. We have seen these boys grow up and mature. They, too, take their responsibilities seriously despite their youth. Each of the dancers weaves his own breast and backplate and makes his own amulets. The masked jester, who represents Cortes’ spy, puts a banana on the horn of his mask. A man watches from the church courtyard sidelines. 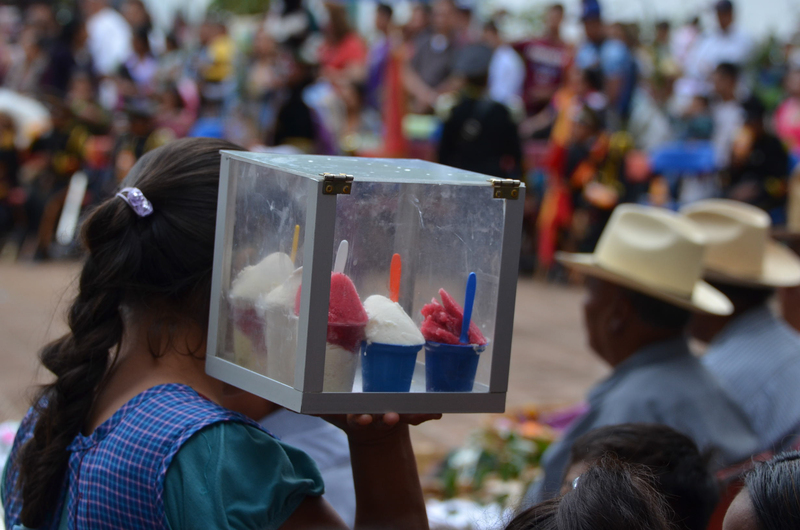 A nieves vendor sells these fruity frozen treats. Our assignment for the workshop was to capture motion by using a slow shutter speed, low ISO and high aperture, experiment with depth of field, and incorporate black and white or sepia. This was a new stretch for me, a challenge that I welcomed! I’ve come to discover that blur is something you want in art photography IF it is your intention! I’m training myself to see those blurred shots a little differently and not discard them (smile). They can evoke mood. 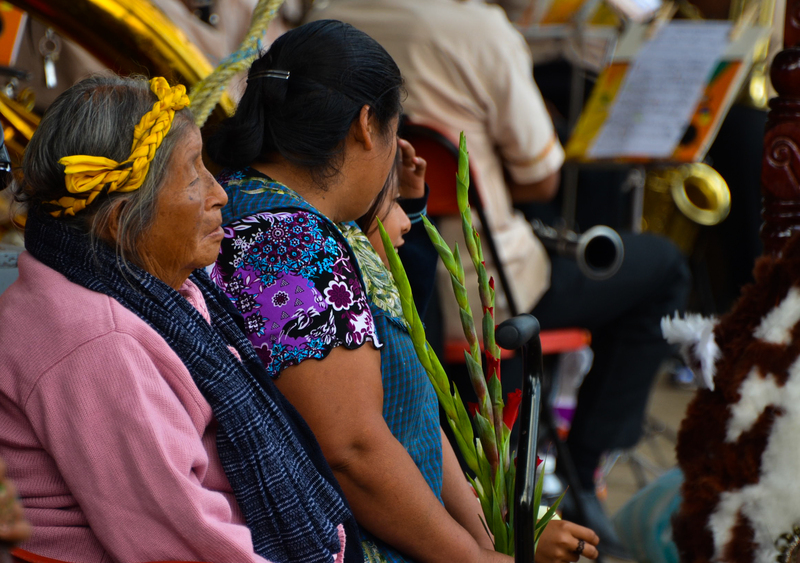 Villagers come from throughout the Tlacolula Valley dressed in their unique traditional clothing. 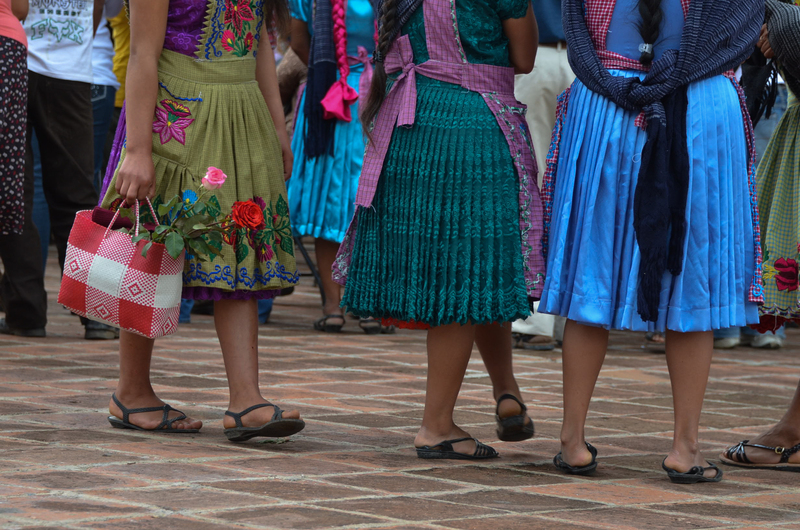 These women from a nearby village wear pleated skirts and floral aprons — a style different from the dress in Teotitlan del Valle. Teotitlan del Valle is a communitarian village. It’s leaders volunteer for three-years of service without pay. The dancers also honor these people who govern their community through consensus decision making. I hope you enjoy these photos and perhaps next summer you can be with us, too. Consider joining in for the Day of the Dead Photography Expedition this October! The feather headdresses are weighty and uncomfortable. The men need to take periodic breaks to reposition and re-tie them. Endurance and athleticism is a necessity for this test of courage and commitment. This entry was posted in Oaxaca Mexico art and culture, Photography, Travel & Tourism, Workshops and Retreats and tagged blogsherpa, celebrations, fiestas, Mexico, Oaxaca, ritual. Bookmark the permalink. Do you know if the documentary from the Bala Xtee Guech Gulai community is available from any source other than visiting the museum? I am sorry. I don’t. I will ask. Love your photos and stories, Norma. I can’t wait to spend some time with you and see it all through your eyes. Lena, it is a special time here, now. And there are many other good times, too. I look forward to sharing them with you. Norma–Thank you for the fascinating information on La Danza de la Pluma. It is amazing how dedicated each participant is with a 3-year commitment. The photos were wonderful and it must be very exciting to see that in person. Love to see people keeping their culture alive through such rich traditions. Robin, thanks so much. It’s been a joy to have your daughter Ellie with us for this week’s photography workshop. She has said repeatedly what a great time she had — lots of fun — muy divertido. I’m so glad we were able to share this experience with her. I know she will have lots of photos to share with you when she gets home. Today, they are off to Oaxaca in a group to explore the city with Omar Chavez Santiago, another workshop participant who lives here. 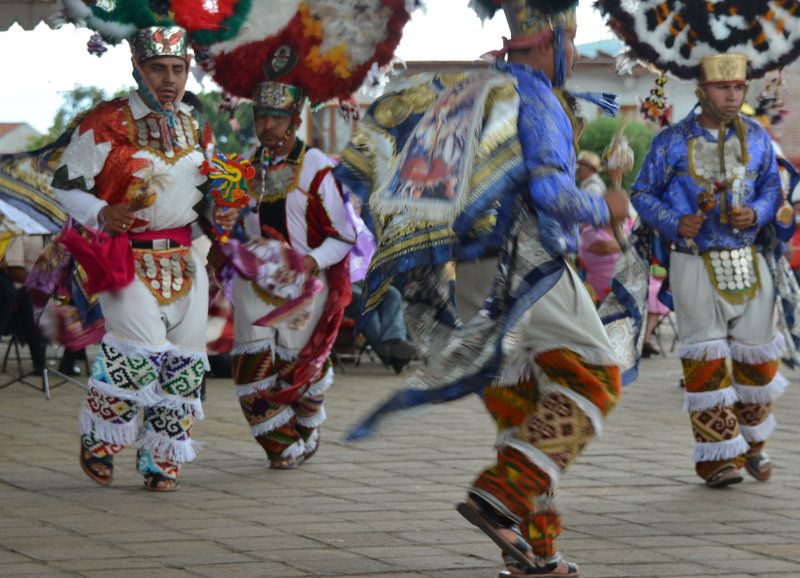 La Danza de la Pluma from Teotitlán del Valle is unique as it is the only group in all of Oaxaca that makes a three year promesa to dance for the patron saints. 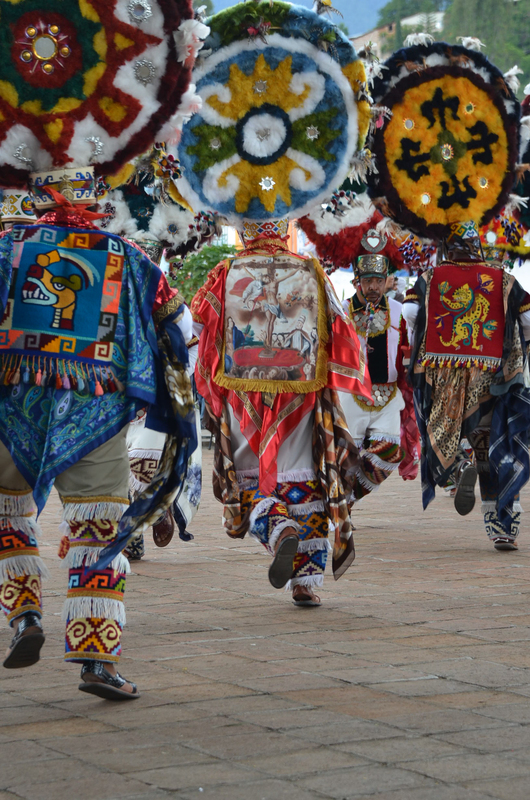 Neither La Danza de la Pluma from Zaachilla or Cuilapan make a promesa. The Bala Xtee Guech Gulai community museum in Teotitlán del Valle has an excellent documentary called “La Danza de la Pluma; Fe, Sacrifico y Tradición that further explains the uniqueness of this group. the dance for Our Lady of Guadalupe on December 12th. Thank you for adding these details for us.